Prince Ivan and his brothers set off in search of the fabled Firebird, which has been stealing golden apples from the royal orchard. Ivan's brothers soon fall by the wayside, indulging their selfish passions. Ivan, guided by the Wise Woman of the Wild Woods, enlists the help of the Horse with the Silver Mane, a fearsome Wolf and Princess Yelyena the Fair. Together they confront Lodgoth, the wicked Tsar of the Frozen Wastes. They rescue the Firebird and head for home... but the adventure has only just begun. 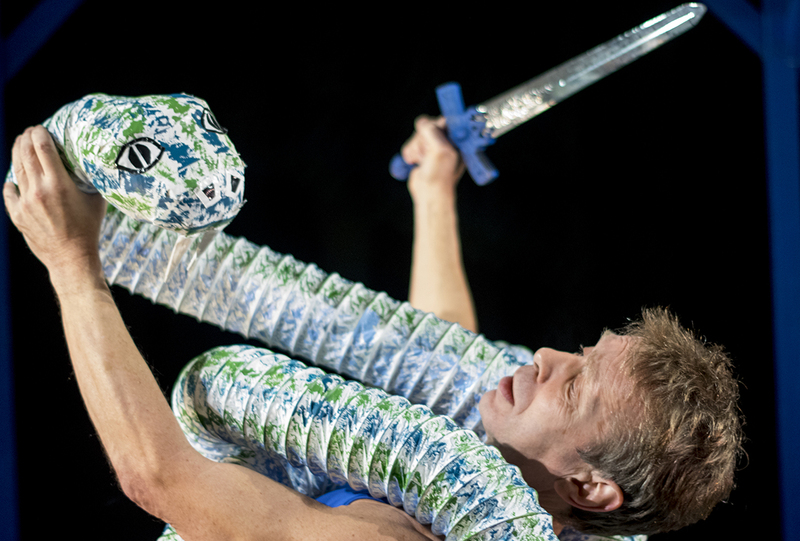 Stimulating, entertaining and intelligent story-telling theatre for children. 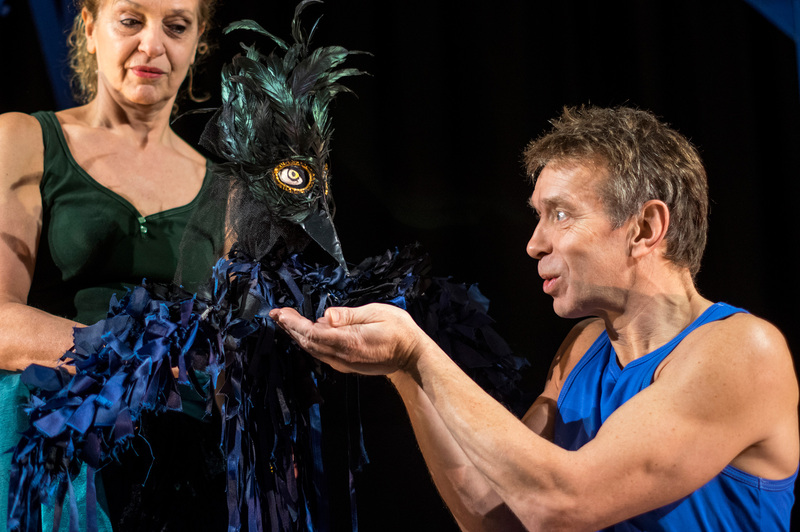 The story is performed by two actors who bring to life a host of entertaining characters, transform everyday objects into fabulous creatures and use live music and song to accompany the adventure. The production is for children aged 5 - 11 and their families. Golden apples are disappearing from the orchard that belongs to the Tsar of the Land of Plenty, threatening the life of the Tsar and the health of the world. The Tsar's elder sons, Peter and Dmitri, fail to catch the thief but young Ivan snatches a feather from the creature of flame. The Tsar recognises the thief to be the Firebird. The Wise Woman of the Wild Woods tells Ivan and his brothers that the Firebird is sent by Lodgoth the Sorcerer, Tsar of the Frozen Wastes. The three brothers set off to free the Firebird and bring her back to revive their ailing father. They come across a Raven, trapped in a tree. Ivan releases her and she tells the boys that they mustn't listen to the music of the harvest dance in the town of Valpurgis. When they reach Valpurgis the boys stop up their ears so as not to hear the music. But a mysterious man called Zamwane tricks Peter and Dmitri into unblocking their ears. Not only do they drink and dance the night away but they also decide to stay there. Ivan heads off alone towards the Frozen Wastes. In the Fearsome Forest, he encounters Vanya the Wolf who helps him to summon Hrothga, the Horse of the Silver Mane at the top of a moonlit mountain. They race through the Fearsome Forest to the shores of the Great Lake. Vanya the Wolf tells Ivan that he must persuade Yelyena the Fair - who lives on the Island of Eternal Spring in the middle of the Great Lake - to marry Lodgoth the Sorcerer. But first they have to battle the Giant Water Snake that lives in the Great Lake. Ivan meets Yelyena and persuades her that she must marry Lodgoth to save the world. Despite having fallen in love with each other, Ivan and Yelyena climb onto Hrothga's back and head for Lodgoth's Palace of Ice. Lodgoth gives up the Firebird in exchange for Yelyena and Ivan is bundled out of the Palace by Vanya and Hrothga before he can object. Racing through the snow back towards his father, Ivan spots something in the snow. It turns out to be Yelyena, magically rescued by Vanya the Wolf. But Lodgoth is after them on board his winged chariot, the Dreaded Sky Slayer. A great battle ensues. The Firebird grows to giant proportions and drives Lodgoth off. Ivan and Yelyena say goodbye to Vanya and Hrothga. They reach Valpurgis where Ivan's brothers have been all this while. The brothers plot to steal the Firebird and claim the reward that they think must be attached. They kill Ivan, grab Yelyena and the Firebird and head off towards their father's palace. Vanya the Wolf has sensed that something has happened to Ivan. He summons the Wise Woman of the Wild Woods who sends the Raven to fetch the Water of Life. She brings Ivan back to life. Ivan gets back to the Palace to find his brothers trying to force the fading Firebird to warm their father. He overcomes his brothers, revives his father with the help of the Firebird, marries Yelyena and inherits the Tsardom of the Land of Plenty. Parents and kids sat mesmerised. Full of music and wit and charm, this is children's theatre at its best. A magical telling of the traditional Russian adventure. The story is performed by two actors who bring to life a host of characters and transform everyday objects into fabulous creatures. They present all the shades and complexities of the adventure through a thrilling blend of live music, song, puppetry and physical theatre. 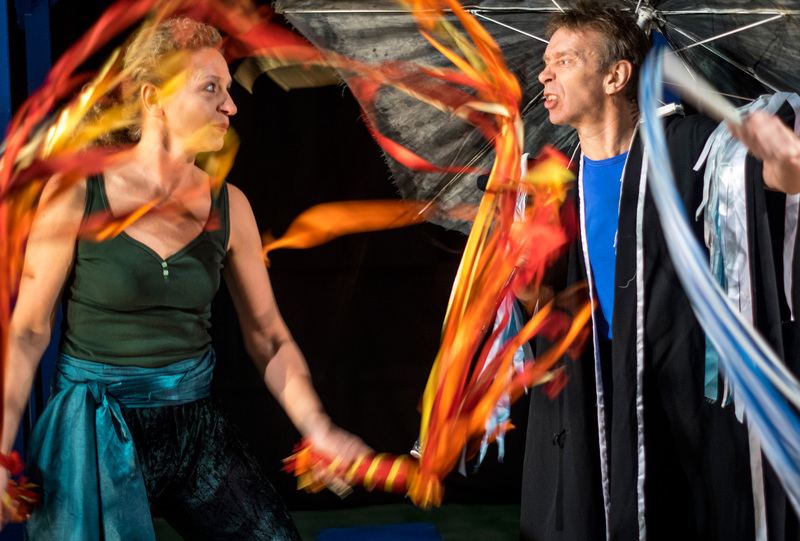 The Firebird has delighted audiences across the UK and in Canada, the USA, Chile, Peru and Finland! Attention, children of all ages! There is something magical going on and you must see it. The magic involves a dying kingdom and its king; a brave son named Ivan and his Princess Yelyena; a talking raven; Vanya, an even more talkative wolf; a horse with a mane of moonlight, an evil wizard and the exquisite Firebird. 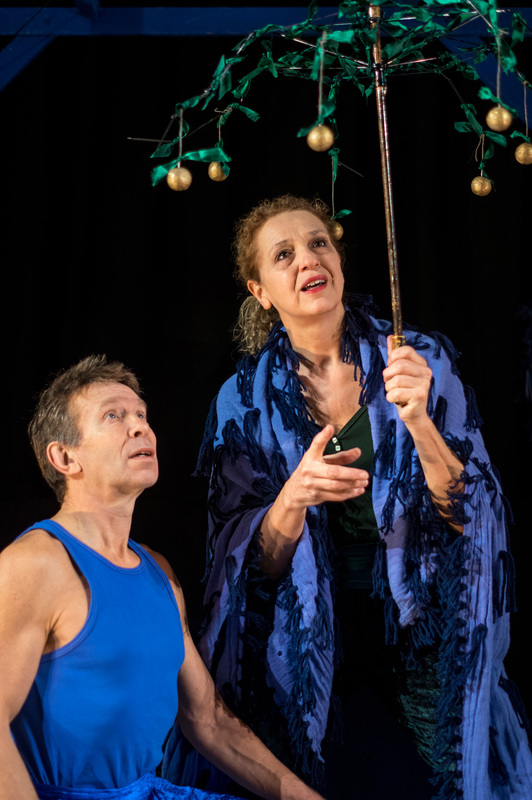 What's magical about the battle they engage in to save the world is that all of these enchanting characters are played by only two actors, Gill Nathanson and Bill Buffery from England's Multi Story Theatre Company. (The are also the creators of "Earthly Delights", a mythical tale for adults that is as splendid in its way as is "The Firebird"). They are utterly convincing in their multi-roles and they do it with a minimal number of simple props - a cape effects the transformation from Wise Woman of the Wild Woods to Princess, a Russian hat turns Princess into wolf. Buffery's voice is an admirable tool and he uses it to propel this rich narrative of loss and salvation. The afternoon I saw "The Firebird" the Studio was filled with parents and kids who sat mesmerized throughout the hour it takes for this enchanting tale to unfold. Full of music and wit and charm, this is children's theatre at its best. "The Firebird" is completely entertaining. It was utterly brilliant and all the children were fascinated. There were lots of things thet they loved - the comedy moments that relaxed them; the pace, which meant they were never bored; the changing characters that made them pay attention; the strong story line that supported their understanding; the clear dialogue and brilliant props absolutely fascinated them. There was also, perhaps particularly, an absolutely right 'pitch' at KS2, but the whole production entranced our youngest children too. We have lots of feedback from the children. As a teacher, I loved it for me and for the insights it gave me about myself as well as the children and the ways they responded, some expected and some totally unexpected.